If you didn’t sow Larkspur seed in October for flowering in late spring, no worries. You can put it on your end of summer to do list. Larkspur (delphinium consolidate)is not the easiest to grow and maintain as it tends to be a bit fussy. 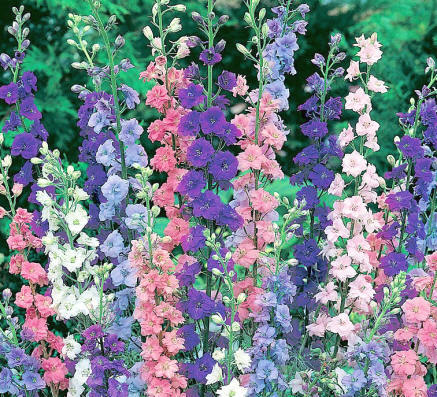 But if you have success, Larkspur flowers will be a beautiful addition to your garden space. For those born next month in July, this is a your birth flower. Each color has a different meaning: the color white symbolizes joy, purple symbolizes sweetness, and pink = fickleness. Larkspur flowers are a great personal touch to your garden if you’re a July baby. I would be remiss if I didn’t warn you that all parts of Larkspur are poisonous. So be careful where you decide to include Larkspur in your landscape. Sweet Woodruff (Galium odoratum) is a shade garden delight, and the perfect groundcover for adding fragrance to your garden space while reducing lawn areas. It’s fast growing, insect repellent, low maintainance, quick to establish, and it isn’t prone to invasiveness, though you do need to keep it in check. 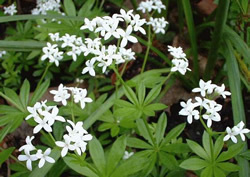 Sweet Woodruff has white spring flowers and an attractive foilage that looks nice in winter, with leaves that smell like freshly mown hay when crushed. Best of all? If you lose some grass, you save on water bills, and help prevent erosion in your garden. The River Birch (her ein my own front yard!) is becoming a more popular landscape tree because of its distinctive bark, graceful crown and tolerance of drier conditions. The appealing tan to cinnamon-colored exfoliating bark of the River Birch is spectacular in the winter, and dynamic in spring, summer and fall. Lustrous, medium-green leaves are another attractive feature. 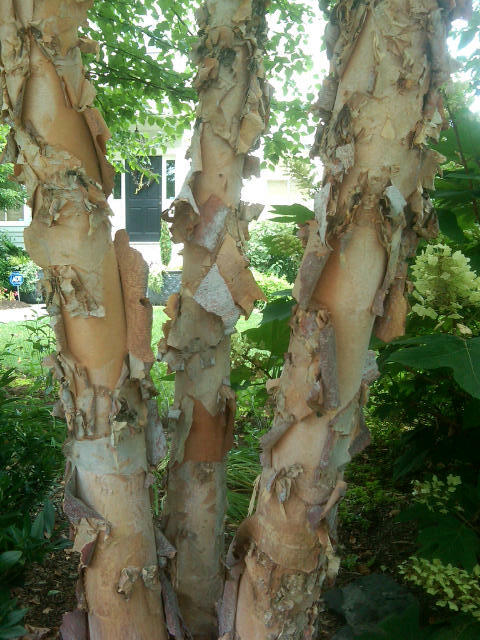 The Riverbirch is tolerant of both wet soils and dry summers however low-lying areas of the landscape that retain moisture is an ideal place to plant a few of these trees. I have three in my front yard which have grown to 40 feet and serve as fantastic barrier from across the street and next door neighbors, creating a peaceful and eye-catching sanctuary.